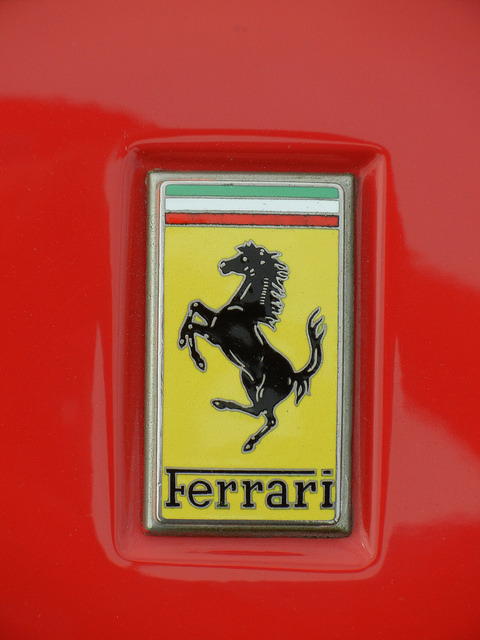 Nixon Motor Sports: FIFTY FUN FAST PHOTOS FEVER! Not all cones are orange! Not all legs have tattoos! Not all drivers wear shorts! Not all events take place on sunny days! 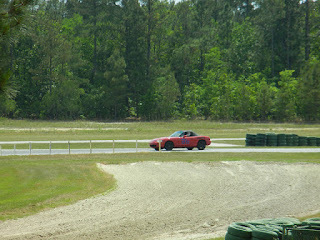 If you know that in autocross the many classes have initials like ES, GS, STX, SMF that's good. Then if you know that Novices in those classes add the letter "N" for NES, NGS, NSTX, etc. You can figure that the Ladies classes add an "L" to their class for LES, LGS, LSTX, etc. So this Navy Landing Craft Air Cushioned just might really be for a Ladies CAC category of autocross. I just write the jokes, I don't guarantee they are funny jokes. This person is responsible for writing the terrible jokes in the previous photo. 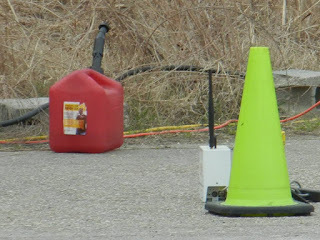 He has been sentenced to wearing a yellow safety vest and a yellow Abarth T-shirt and wearing a radio ear piece for the rest of his life on this deserted island with only 7 cones to keep him company, so we probably won't be hearing from him any time soon. Before being sentenced to wearing a yellow safety vest and a yellow Abarth T-shirt and wearing a radio ear piece for the rest of his life on this deserted island with only 7 cones to keep him company, he is alleged to have been seen driving this Italian-designed Mexican-built with a US-built-motor. Key word "allegedly driving" since he was too slow for the radar gun to get a reading. A yellow Lotus Esprit- spotted outside a recent autocross. I believe this is the same model that Roger Moore as 007 drove underwater in one of the James Bond movies. This one seems to not have the optional underwater package, but you might want to check your local Lotus dealer to see what the newer model has! The new Lotus will retail starting at $89,900. The Ford EcoBoost Challenge came to Raleigh NC recently, and NMS was there to test their reaction time in the Focus ST. In two runs against the Christmas tree lights like a drag race, we found that the Focus is fun to drive, but that our reaction time was better measured with a sun dial or maybe a weekly calendar. Somewhere between Raleigh NC and Carolina Motorsports Park near Kershaw SC, is THE ROCK, also known as Rockingham Speedway. Just for the chance to say we'd been there, here's a photo of the sign outside the grandstands and track that are still there. 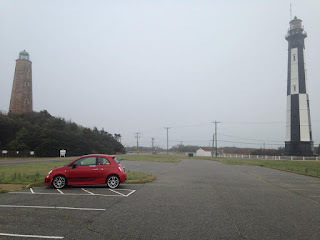 Across the street is a still working drag strip, which was hosting some big event of some kind. Either that day or later this summer they were having a concert with your favorite singer Pink, but we didn't get any free tickets so we headed on down the road. Brian is just about ready to head back out on track during day 1 of the two day High Performance Driver Education weekend with NASA. After a few modifications (by few I mean "he's had about 13 different blog posts about all the different mods so far"), things went well over the weekend for the 99 Miata. Spotted this FIAT 500 Abarth all race prepped for the track at CMP too. You can tell it's ready for action because it's got plenty of cool graphics, and a cool bit of flames on the left end of the red stripe. With a roll cage and racing seats inside, it looked like fun and sounded great out on the track too! During the two days Brian drove in 7 different sessions on track, and as you might imagine the only way to get the drivers off track is to wave a checkered flag at them. Unfortunately, the flag man didn't have the flag visible in this photo at the end of one session, otherwise you can just Photo Shop a big ol' checkered flag in his hands, and while you're at it, put in the Japanese F1 track at Suzuka while you're at it...thanks! Is most accurate I've seen! Foggy day with FIAT and two lighthouses. There's a joke here somehow if you remember the FIAT commercial that showed the cars jumping into the ocean in Italy and swimming to the US. I didn't say it was a funny joke. If you're near the Washington DC area, up to a few hundred miles, I recommend you visit Mission BBQ for some of their great food! 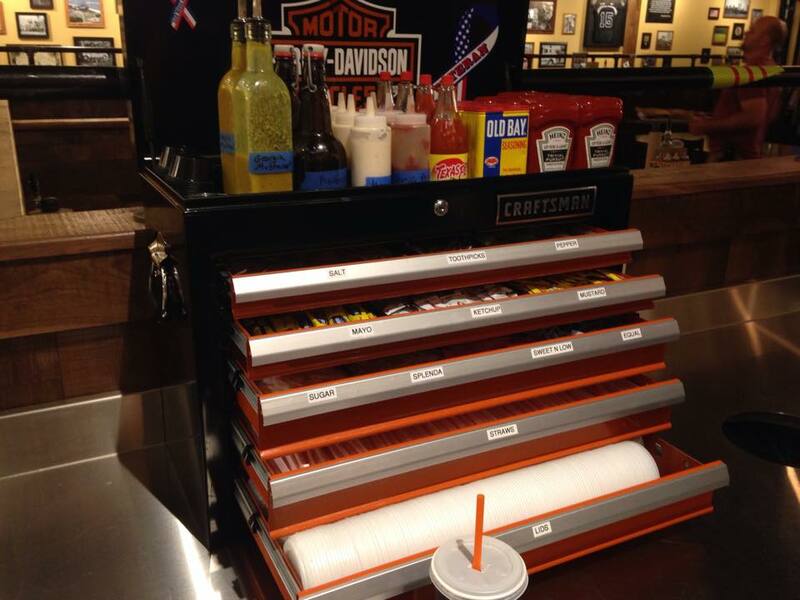 Not only do they decorate their restaurants with police, firefighter, and military stuff, the one in VA Beach has this awesome tool-box-condiment holder! Reminder; June 24th should be the big announcement from Alfa Romeo on what their next car sold in the US will be. 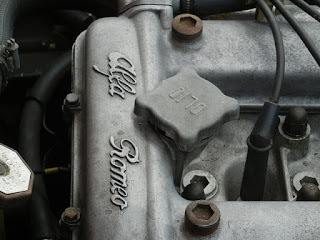 In the meantime here's an older Alfa engine, complete with Italian "Olio" oil fill cap. Another joke tells how the clueless motorist was instructed to remove the "Olio" cap in Italy, but all they could find was the one marked with the numbers 0170. If you don't get the joke, just look at OLIO upside down. Is the horse Mr. Ed? Hey, that's two terrible poems today! 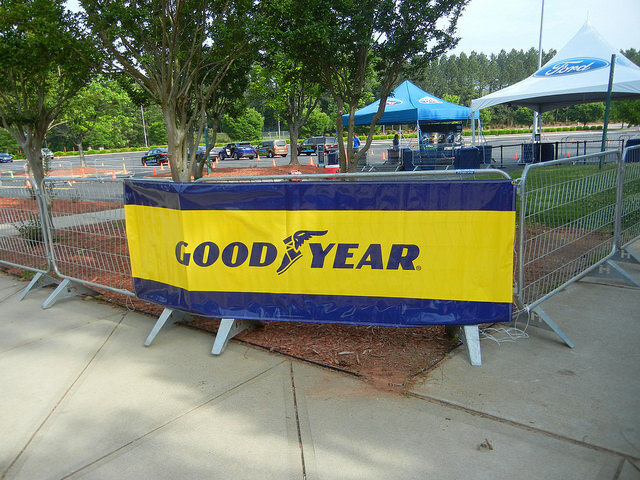 Good Year was one of the sponsors of the Ford EcoBoost Challenge. 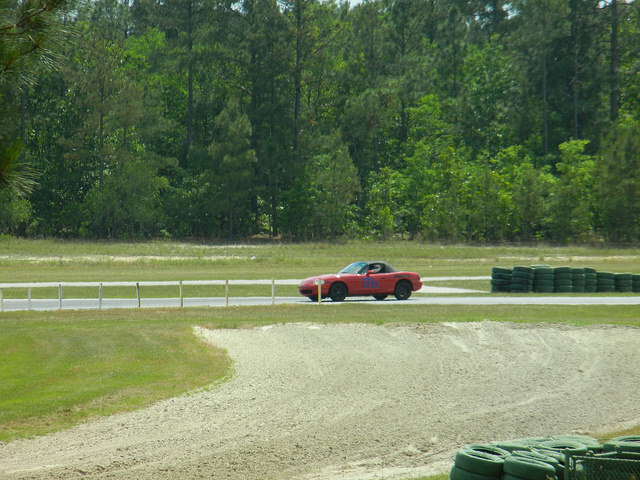 We close this time with a shot of Brian in the #86 Miata on track at Carolina Motorsports Park a few weeks ago. If you check out the details from way over here off the track, you can tell that the track has a lot of safety features such as the sandy run-off area to slow any out of control cars, plenty of tire walls around solid objects, and even the markers sticking up on the inside of turn one here that Brian is entering. Keep safe! Enjoy the weekend!